When a child suffers a brain injury, whole family’s lives can change. We are here to ensure that nobody has to face the effects of brain injury alone. But, we could not do this without companies’ support. The Child Brain Injury Trust works with companies on mutually beneficial partnerships. By working with us, you can reach new audiences, associate your brand with our professional and caring reputation and reinforce your reputation as a socially responsible organisation. To find out more please contact Rachel Ritter, Head of Commercial Partnerships on 01869 341075 or rachelritter@cbituk.org. Whether you would like to donate products, your time or help us at our events, there are lots of different ways to get involved with the Child Brain Injury Trust and support families affected by acquired brain injury. Gifts in Kind and Volunteering are great ways to meet your corporate social responsibility objectives and have some fun along the way. We have local support projects that hold annual events for the families we work with, or perhaps you would be interested in volunteering your time at a collection. There are lots of different ways and you can find out today, by contacting our fundraising team. You can also become an official volunteer for the Charity here. There are lots of different sponsorship opportunities for business of all shapes and sizes. We have sponsorship opportunities ranging from national campaign weeks to local events for the families we support. A sponsorship opportunity can help raise your company profile nationally or in the local community. We are experienced at working with companies to create a unique sponsorship package to suit both the Charity and the company’s requirements. If you would like to find out more about our Campaign work – why not have a look at our previous campaign work. You can then get in contact with our friendly fundraising team. We are able to provide you with detailed sponsorship proposals ensuring both parties get the most out of the opportunity. Staff involvement is a great way to start off a charity partnership. Whether you or your team would like to parachute, run, bake or cycle to support the Child Brain Injury Trust, we will be there to support you with fundraising advice and materials. See our Fundraising Challenges page to see what current activities there are in your area. Contact our Fundraising Team and find out about other exciting staff fundraising ideas. Our work would not be possible without the support and generosity of our company partners. Have a look through our current partnerships and find out about all the great work we have managed to achieve together. We would also like to thank our partners for their commitment and support. Bolt Burdon Kemp is an active member of the Child Brain Injury Trust’s London Fundraising and Development Group. Originally involved in the Charity’s Legal Directory the partnership has continued to grow over the years. In 2014, when the Charity made an urgent appeal following the loss of their Department of Health funding, Bolt Burdon Kemp made a generous donation of £5,000 and has continued to actively support the Charity since. For the past three years the company has sponsored the Charity’s Action for Brain Injury Week and the art project campaign. This is an initiative to help children with a brain injury express themselves through art. In 2014, the team also took on the Kamikaze mud challenge to fundraise for the Charity. Bolt Burdon Kemp continue to support the Charity through the London Development Group and look forward to more involvement throughout. Visit their website at www.boltburdonkemp.co.uk. We were pleased to have been chosen as Clarke Willmott Birmingham’s local Charity of the Year throughout 2015. 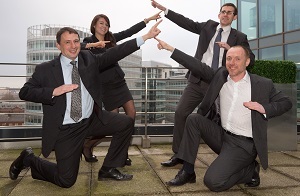 Their Birmingham office supported our local family support project during an exciting year. In 2015, we established a Midlands based support worker. In September 2015, the Clarke Willmott team raised over £800 through a sponsored skydive. Three brave members of staff jumped from over 10,000ft as part of the tandem skydive. 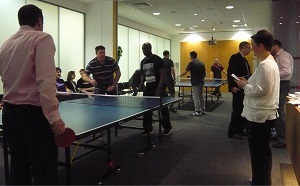 The offices have also taken part in dress down days and a fantastic Table Tennis Tournament in March 2015. Clarke Willmott invited local companies to join the tournament in an exciting evening of fundraising. We thank Clarke Willmott Birmingham for their support throughout 2015. We are pleased to announce that Clarke Willmott will be continuing their partnership throughout 2016 and have recently started up a Birmingham Fundraising Group with other supporters in the area. The Charity looks forward to continuing to work with the team in 2016. You can visit their website here. This Scottish legal firm have been firm supporters of the Child Brain Injury Trust for a number of years. It is their expert knowledge of the legal, social, medical and financial issues faced by families when a child’s brain is suddenly injured that gives them such an appreciation of the vital services the charity offers. You can visit the Digby Brown Solicitors’ website here. 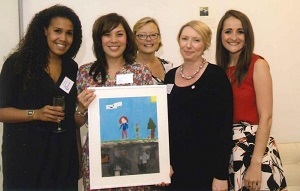 In 2012 Digby Brown staff selected the Child Brain Injury Trust as their charity of the year. Regional Fundraising Officer Claire Murray addressed staff at the firm’s annual away day in Perth to let them know where the money they raised would go, what it would help pay for and why it was so desperately needed. 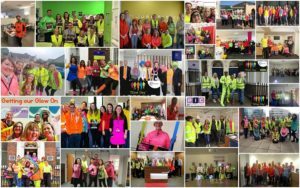 The combined fundraising activities of Digby Brown staff, generously matched by the firm, led to over £12,000 being raised. This amount of unrestricted income is hugely significant for a small charity such as ours and helped us to continue offering essential support to families in the region. Access to the expert skills of our supporters helps ensure all the money we raise goes to supporting children and families. Digby Brown’s team have created logos for our national campaigns, designed information materials, provided venues for training events, and expert legal and welfare/benefits content for our website and webinars, as well as inviting us to events where we gain the opportunity to increase our network of supporters. 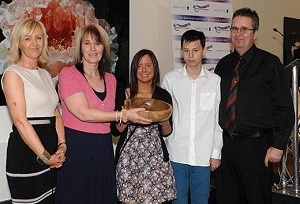 In 2014 together we launched the Child Brain Injury Trust’s Scottish Legal Support Service. Digby Brown Solicitors now offer free legal and welfare advice and discounted services to everyone supported by the Child Brain Injury Trust. The dedicated phone line (0333 323 0189) makes it simple for people to access information on everything from benefits advice to wills and everything in between. Our experience with Digby Brown Solicitors shows how a relationship between a charity and a business can be long term and mutually beneficial, and how it may grow and develop from a one off charity of the year situation to something more sustainable. We hope to continue this relationship and to continue together to increase awareness in Scotland about childhood acquired brain injury. Irwin Mitchell has been involved with the Child Brain Injury Trust since they had local support groups many years ago. Most recently, we were pleased to announce Irwin Mitchell as the Charity’s Legal Support Service Provider for Yorkshire, Humberside and the North East. You can visit their website here. Irwin Mitchell Sheffield and Leeds were heavily involved in fundraising throughout 2015. 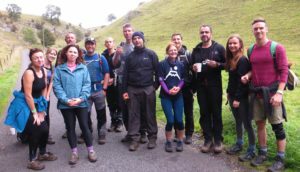 The Sheffield Serious Injury Team organised a sponsored walk in Edale, Derbyshire. The event was well attended with over 120 turning out and raised over £5,000. Irwin Mitchell is also very keen to include our beneficiaries in their fundraising and support. In March 2015 they organised a small family walk for beneficiaries and children. Their offices throughout the Legal Support Service region have also been very generous with funding local pantomime tickets and a pamper evening for parents. In 2016, they are sponsoring another Family Event for beneficiaries at the Yorkshire Sculpture Park. We are also pleased to be working with Irwin Mitchell’s Leeds office, who recently held a Fashion Show evening and raised over £1,700. We continue to work with Irwin Mitchell and are grateful for their long term support as one of the Legal Support Service Providers and in our Fundraising Groups. JMW Solicitors started supporting the Child Brain Injury Trust in 2012. Since then they have taken part in lots of exciting fundraising challenges and we recently announced their partnership as the Charity’s Legal Support Service Provider in the North West. This is a three year project running from March 2015. They work closely with our Family Support Coordinator to ensure families receive the correct support and information. To request your copy of our Legal Support Service Booklet, please contact our Helpline. 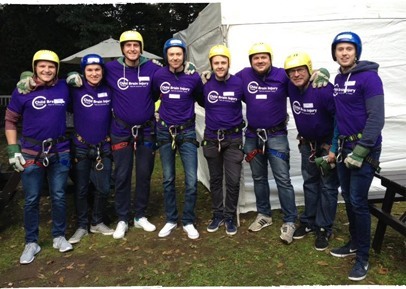 Back in 2012 the team took part in a Zip Slide across the Manchester Canal to kick start their support. Since then they have taken to running marathons and even joining our Great North Run team in 2013. The team of four taking part in the Manchester Marathon in 2013 raised over £4,000 for the Charity. In 2015, JMW Solicitors announced the Child Brain Injury Trust as their Charity of the Year. So far they have held a number of office fundraisers and events raising funds for the Charity. 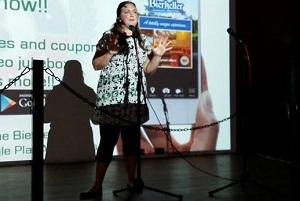 They also organised their first Comedy Dinner raising over £20,000. They look forward to repeating the event again in 2016. Watch this space for more updates on our corporate partnership. You can visit their website here. “We’ve had a relationship with the Child Brain Injury Trust since 2012, and in that time, we’ve been delighted to be able to support them in the North West. Because of the work we do, we see a lot of families with children who are affected by acquired brain injury, and we’re only too aware of the importance of having good, strong support in place during the initial rehabilitation period and beyond. We believe the Child Brain Injury Trust is in a wonderful position to offer families that support and assist them in working towards the future. In 2014, Kings Chambers’ Personal Injury, Clinical Negligence and Healthcare proudly announced the Child Brain Injury Trust as their Charity of the Year. The Chambers pledged to raise £5,000 through various challenge and fundraising events and achieved this. 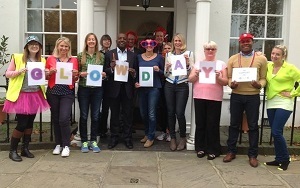 The team started their fundraising by marking Action for Brain Injury Week in May with a dress down day and bake sale in each of their offices in Manchester, Birmingham and Leeds. But the fundraising did not stop there. Members of the Chambers also took part in the Great Manchester Cycle and Great North Swim at Lake Windermere. In October 2014, Kings Chambers organised a Brain Injury Conference in Manchester aimed at professionals working in Personal Injury and Clinical Negligence law. The event was also kindly sponsored by Nestor. It was a one day conference at the Palace Hotel with various speakers including, Lauren Stacey. Lauren spoke on behalf of the Child Brain Injury Trust talking about life with an acquired brain injury. The event was a huge success raising over £3,500 for the Charity. Kings Chambers continue to support the Charity through their involvement in the Manchester Fundraising Group. This is a Group of professionals in the brain injury community who support the Charity on a local level. Most notably they sponsored the drinks reception at JMW Solicitors’ Comedy Dinner in September 2015, which raised over £20,000. You can visit their website here. Nestor first became involved with supporting the Child Brain Injury Trust in 2014 and sponsored a number of activities in 2015. In April 2015, Nestor was the sole sponsor of the Charity’s exclusive House of Lords Dinner for 65 guests. This was a special occasion where supporters gained access to a tour of the House of Lords and a dining experience in the Peers Dining Room. We were also pleased to have Nestor as the 2015 Autumn Safety Campaign sponsors. With the support of Nestor, the campaign raised over £7,000. They continue to be an active member of the Manchester Fundraising Group. 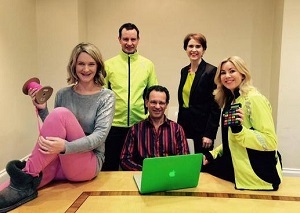 In 2015, members of their company took part in an organised cycling challenge through the Group and have attended a number of their other events. You can visit their website here. NewLaw Solicitors have supported the Child Brain Injury Trust for a number of years. For 2014 we were their chosen Charity of the Year. We are pleased to announce the partnership raised over £10,000. Most notably NewLaw Solicitors held their Annual Charity Ball in September 2014 with proceeds going to the Child Brain Injury Trust in 2014. This year was of particular importance, as the company celebrated their 10th anniversary. But the fundraising did not stop there. 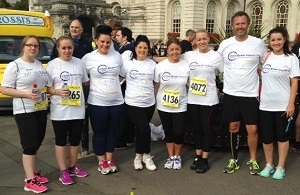 Members of staff held bake sales, office sweepstakes and ran the Cardiff 10K to raise much needed funds for the Charity. In 2015, we were pleased to announce NewLaw Solicitors as the Charity’s Legal Support Service Provider for Wales. NewLaw continue to work with the Charity locally, with the Family Support Coordinator in the area and are members of the Cardiff Fundraising Group. You can visit their website here. 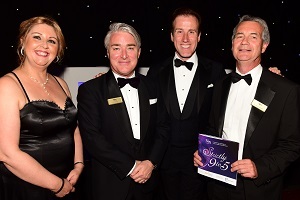 No5 Chambers have supported the Child Brain Injury Trust for a number of years. They have been a long standing sponsor of the Charity’s annual conference held in March each year. In 2015, the Chambers quite literally stepped up their support by organising a Strictly Come Dancing inspired fundraiser. The event was held at Aston Villa Football Ground on 5th June. Local Birmingham legal figures were invited to dance off in front of over 400 people after a number of weeks of intense training. The event raised over £23,000 for the Charity. We are pleased to announce No5 Chambers will be hosting Strictly 9 to 5 again on Friday 10th June 2016 to support the Child Brain Injury Trust. You can visit their website here. 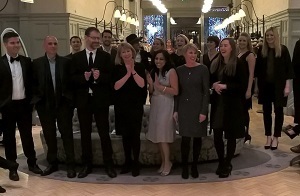 30 Park Place Chambers have chosen the Child Brain Injury Trust as their Charity of the Year for 2016, and we look forward to an exciting year ahead working together. So far 30 Park Place Chambers have been an active part of the Charity’s Cardiff Fundraising Group and have lots of fantastic event idea. They will be hosting a quiz night, tag rugby tournament and possibly even a talent show to raise funds. 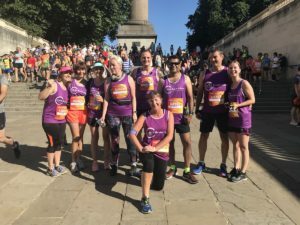 This is alongside some fantastic in office fundraising and individuals in chambers taking on challenges, such as an Ultra Marathon in May this year. As the partnership starts out there are lots of exciting plans; be sure to watch this space to find out more as we continue to work together throughout 2016. 30 Park Place Chambers is a barristers chambers based in Cardiff. To find out more, please visit their website here. 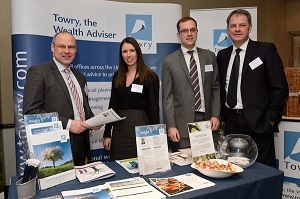 In previous years Towry have sponsored the Child Brain Injury Trust’s Annual Conference for professionals and families. The event is held in March each year and is a key date in the brain injury community diary. On a regional level, members of Towry are actively involved in a number of the Charity’s local Fundraising Groups. Most notably, Towry have hosted a wine tasting event in Manchester for the past two years. In 2015, the evening raised over £4,000 and took place during Action for Brain Injury Week. Towry and the Group will be hosting their Wine Tasting Evening in Manchester on 12th May 2016 in Action for Brain Injury Week again this year. You can visit their website here.